On the commute home from work, a man suddenly has a brilliant flash of insight and comes up with a unique business idea. Having long ago achieved financial freedom, he is no longer compelled to work for his employer and has sufficient capital to pursue the idea. A month later, a small office is set up and, before long, there are a dozen employees at work turning the idea into reality. Through ownership of 100 percent of the equity of the business, there is no conflict between the owner and the manager because he is the same person. Three years later, a major expansion opportunity requires additional capital. The owner’s father-in-law, being a successful businessman himself, provides capital (and, in due course, unsolicited advice) in exchange for 40 percent of the equity. Although the business is still “all in the family”, Thanksgiving dinner becomes a little more awkward that year. Some element of an agency problem exists the moment a business transforms from a pure owner-operator model to one that involves outside shareholders. Obviously, the degree to which an agency problem exists depends on the individuals involved, the separation between owners and managers, and the amount of equity that management continues to own. The character of management counts a great deal, but few managers treat non-management owners as true “partners” in the business. 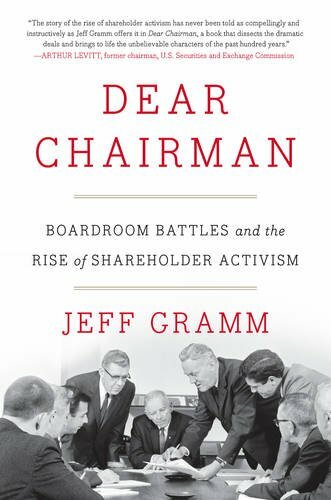 In Dear Chairman: Boardroom Battles and the Rise of Shareholder Activism, Jeff Gramm provides an entertaining history showing that the agency problem and shareholder activism is nothing new. The media often portrays shareholder activists as rapacious and amoral individuals with no social conscience. While this is sometimes true, more often the interests of owners are advanced by activists. Through eight chapters presenting interesting case studies, the book offers insights into how activism has evolved over nearly a century. Social mores have changed dramatically but the inherent tension between managers and owners has been a constant. The case studies range from Benjamin Graham’s campaign against Northern Pipeline in the late 1920s to campaigns by Dan Loeb and Carlo Cannell in recent years, and it is likely that readers will find different chapters more or less compelling based on their interests and period of personal involvement in the stock market. Not only were Northern Pipeline’s managers behaving in a manner similar to many corporations today, they apparently pioneered one of the annoying tactics management often uses to discourage shareholder involvement. The annual meeting was held in Oil City, Pennsylvania even though the company’s executive offices were conveniently located in New York City. The remote location did not stop Benjamin Graham from going to a meeting to make a presentation on how to distribute the excess capital. However, due to a procedural motion, he was not even permitted to speak at the meeting. Northern Pipeline’s management also tried to obfuscate the issue by claiming that investors with no operational knowledge of the business were trying to exert operational control when the question was entirely one of capital allocation. Sound familiar? We can be sure that Warren Buffett knew about the Northern Pipeline story when he began investing in Sanborn Map Company three decades later. As we discussed in a review of Warren Buffett’s Ground Rules, the Sanborn Map situation involved a very similar scenario of an operating company being coupled with a large securities portfolio representing capital that was completely unnecessary for the business with management stubbornly clinging to that capital. Sanborn Map is also briefly discussed in Dear Chairman. Mr. Buffett no doubt was inspired by the Northern Pipeline example as he launched his own activist campaign against Sanborn. One chapter in Dear Chairman stands out as a bit different from the rest. In the early 1960s, American Express faced a dangerous situation in which much of its economic goodwill could have been eliminated due to the salad oil scandal. The book provides details regarding the background of the scandal and how management initially reacted to it. However, Mr. Buffett did not launch an activist campaign against American Express management. To the contrary, he sent a letter to management supporting its decision to cover the losses of customers even though doing so was not strictly required from a legal perspective. Other investors were not pleased with American Express absorbing losses that the company was not contractually required to cover but Mr. Buffett understood that the savings in hard cash would be far outweighed by the loss of reputation and associated economic goodwill. Here we have a wonderful example of a young Warren Buffett explicitly advocating for the reduction of tangible book value of a company in exchange for economic goodwill that was nowhere to be found on the balance sheet but nevertheless a very real asset. Many investors believe that Warren Buffett shifted from a “pure value” approach to “paying a fair price for a great business” with Berkshire’s acquisition of See’s Candies in 1973 but the salad oil scandal at American Express shows that his appreciation for economic goodwill was already well developed a decade before the See’s purchase. The book does not present shareholder activism in a one-sided manner. Critics of activism often complain about short term oriented activists motivated by greed rather than the long term health of a business. At times, misguided activism can destroy tremendous value for shareholders. In the BKF Capital chapter, we are presented with a case study of failed activism that destroyed an asset management company. BKF Capital was criticized by the activists for having high expenses that transferred most of the benefits of assets-under-management growth from shareholders to employees. Asset management companies are notorious for high compensation costs and BKF Capital had higher costs than several firms that the activists claimed were comparable. Management argued that the comparisons were not valid for a small and rapidly growing firm and that cutting compensation would result in an exodus of talent and destruction of the company. In the end, that is precisely what happened when the activists got their way. The activists were not necessarily incorrect in their criticism of BKF Capital. The Chairman and CEO had made some questionable decisions that suggested nepotism and the compensation levels were certainly high. The problem is that the activists apparently failed to ask an important question: “And then what”? What are the second and third order effects of cutting compensation when it comes to asset growth? Is the flight of talent a realistic risk that must be taken into account? It appears that not enough second-level thinking took place. Sometimes in the heat of battle, there can be an excessive focus on “winning” and not enough focus on what happens after the “victory”. Even Warren Buffett was not immune to making decisions in the midst of a boardroom battle that he would later regret. On May 6, 1964 Seabury Stanton offered to purchase the Buffett Partnership’s interest in Berkshire Hathaway for $11.375 per share. Mr. Buffett was not pleased. He had previously offered to sell its holdings for $11.50 per share and Mr. Stanton had said “Fine, we have a deal.” In response to insulting tender offer, Mr. Buffett instead began accumulating more Berkshire shares and eventually took control of the company in 1965. Although Berkshire has worked out remarkably well, the outcome would have been far better had Warren Buffett resisted the urge to “win” in his battle with Seabury Stanton. Any aspiring activist has to be humbled by this story. Whether the reader aspires to be an activist or simply wants greater insight into activism and the impact on target companies, Dear Chairman contains insights and lessons that are worth careful consideration.